Deborah Anapol divided her Pelvic Heart Integration teaching programme into three main sections, which she called Activations. Activation 1 introduces two main elements that underlie the whole programme. The first is the relationship between heart and pelvis. To introduce this, she taught us to first teach the four-part PHI Breath Cycle. Secondly, she introduced and explored the relationship between the inner masculine and the inner feminine, and explored what she called the “four genders” — yin masculine, yin feminine, yang masculine and yang feminine. Our sense of identity is bound up with these “inner voices” of the masculine and the feminine implanted by our childhood mother- and father-figures, which become unconsciously our inner guides. In this first Activation we explored what their messages are, and start the process of transforming them, “pressing the reset button”, as Deborah put it. Activation 2 takes this work deeper. Our habitual character types may be recognized in typical body-structures, as in typical behavioural patterns, and may also be released both through breath and bodywork, as well as through gestalt psychotherapy. Activation 2 looks more deeply at where in the body we habitually hold and restrict our energy flow, and works to release these blockages. It also goes more deeply into transforming negative conditioning into positive inner support, drawing on gestalt and constellation techniques. Bringing into consciousness the ancestral masculine and feminine voices that lie behind the parental voices held in our bodies (which Deborah demonstrated brilliantly) may also be included in this section of the work, and leads to the release of dysfunctional patterns around many issues of gender, sexuality, relationship and love, passed down to us through the generations, “pressing the reset button” for patterns that have become entrenched in a whole ancestral line. Activation 3 is about fully stepping into freedom. The work with with the Breath Cycle and the inner voices is now combined with with intimate massage and bodywork. This final Activation invites the participant to completely embody the integration of heart and pelvis, harmonize the voices of inner masculine and inner feminine, and step into the pleasure and freedom of being fully alive, fully “in choice,” or as Samuel Taylor Coleridge put it, “delivered up into your own charge”. 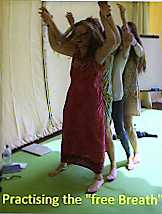 Deborah suggested that we should offer these activations either one at a time as a series, whether in individual sessions or in short workshops, or in longer workshops combining a number of Activations in longer workshops, or as intense longer workshops covering the whole cycle of the Activations as completely as what she called an “Immersion.” The Breath, Bodywork and Transformation workshop that we sometimes call an “intensive” is a condensed version of Deborah’s “immersions”.